Background: Male medical student interest in the field of obstetrics-gynecology has significantly decreased in the last three decades. A perceived patient preference for female obstetrician- gynecologists (Ob-Gyn) and subsequent gender differences in clinical productivity and compensation may influence this trend. Objective: To explore how provider gender affects clinical productivity and salary among obstetrics- gynecology generalists. Methods: An analysis of productivity and salary data for generalist Ob-Gyns employed by an academic integrated health system was performed. 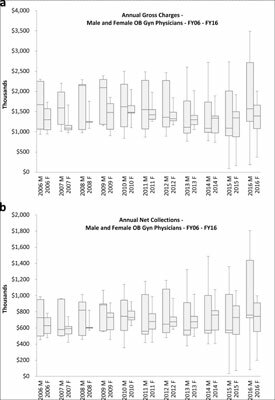 Gross charges, net collections, physician payroll information, work relative value units (wRVUs), new and existing patient encounter volumes and clinical full-time equivalent (FTE) status were compared year over year by physician gender using a repeated measures ANOVA test. Results: On average, male providers earned a numerically higher salary in each year studied, but when the entire timeframe was evaluated, there was no significant difference in salary nor total productivity between women and men (p=0.19 and 0.15, respectively). There was a gender difference in how total productivity was achieved, with women seeing twice as many new patients (p= 0.0025), and men achieving higher average wRVUs per patient encounter (p=0.02). Conclusions: There was no significant difference in total productivity and there was no significant difference in salaries between male and female Ob-Gyns. However, there were differences in the type of care that contributed to productivity by gender. Female providers saw a higher proportion of new patient encounters, while male providers accrued a higher wRVU per encounter, likely as a result of higher procedure volumes. These findings are an encouraging sign that men are not disadvantaged in terms of productivity in obstetrics-gynecology and that compensation models such as the one in this system can promote fair payment in mixed-gender physician groups. Gender, productivity, compensation, obstetrician, gynecologist, salary data.